Part of the joy of liking things is talking to other people who also like those things, or telling people about those things because they might like them too. It’s like matchmaking, with media. So, I thought I’d start sharing some things I like every once in a while, be it books, podcasts, TV, movies or whatever forms of media they invent in the future. I started this book at 11pm one night, which was a bad idea because I stayed up until 5am reading it. This was not great for my circadian rhythm, but I had find out what would happen next, and then what would happen after that, and then oh-my-gosh is that the sun rising outside? Set in the near future, the creator of a popular online virtual-reality/game system dies and wills his company to whoever can find the three hidden keys and gates in the system. Said creator was really into 80’s gaming and movies, so the clues and keys are all related to that era. I’m not a huge gamer, but as someone born in the 80’s I did catch most of the references and enjoyed the pop culture nostalgia. But even if you don’t know anything about that time, the characters and the excitement of the race make the book enjoyable even for noobs. 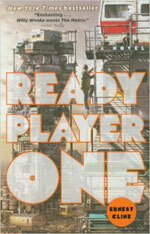 The book’s supposed to become a movie directed by Steven Spielberg, though it seems like it would be a nightmare to get the licensing rights for the games and movies that are so essential to the book. Bonus recommendation: The author also appeared in the documentary Atari: Game Over which investigates the rumor that Atari buried thousands of copies of the unsuccessful ET video game in a landfill in New Mexico. It became a big urban myth and finally some people got the money and the permission to dig up the landfill and see if it was true. I won’t ruin the ending for you, but it’s on Netflix streaming if you’re interested. When everyone was raving about Serial last year, I was really loving Startup, a podcast by former NPR reporter Alex Blumberg following him as he started a podcasting company called Gimlet Media that publishes original content. As someone who’s been self-employed for six years, I really loved hearing about all the behind-the-scenes challenges. Some of it was painful to listen to, but it was always interesting. In season 2, they followed a different startup called Dating Ring which is a matchmaking service started by two female entrepreneurs. Along with the stories about growing a business and the unique challenges female owners sometimes face, there was also interesting info about dating services in general, particularly in episode 6, Profiled. For instance, black women have the toughest time getting dates on online dating sites, getting only 75% of the ratings, messages, and replies of everyone else. Also people will rarely go on a date with someone who isn’t as attractive as them. But in an experiment, OK Cupid developed an app that didn’t show profile pictures, and for people who went on dates using that app physical attractiveness didn’t factor into how enjoyable the date was itself. So, basically if we weren’t biased against ugly people we would all probably be more likely to find a soulmate. Mystery Show is one of the podcasts published by Gimlet Media and hosted by Starlee Kine, who you might know of via This American Life. For this show she solves mysteries that other people couldn’t solve by themselves or by just using Google. For instance, an author sees Britney Spears carrying her book in a paparazzi photo and wants to know how Britney got the book and what she thought of it. Or in another episode, a guy finds a fancy breakfast-themed belt buckle that features little mini toast that can pop up and back into a toaster and wants to find the original owner. The show is just as much about the detours she runs into while trying to solve the mysteries as it is about the mysteries themselves. I should also admit, sometimes I want to know the solution to the mystery right away, so I have skipped ahead to the end of several shows, and then skipped back to the beginning to listen the whole way through. I also skip ahead while reading books. I am an awful person. I stumbled upon The Weekly Planet podcast when I was searching Google to find out more about the Infinity Stones in the Marvel Cinematic Universe. (If that doesn’t interest you, this podcast probably isn’t for you either). I found a fun video narrated by a guy with an Australian accent and saw his podcast advertised at the end, so I checked it out. The Weekly Planet consists of Mr. Sunday Movies and his friend, Nick Mason, discussing the latest movies, TV shows, games, etc. usually having a sci-fi or comic book affiliation (basically geek bait), though not always. For instance, their take down of the Entourage move cracked me up, starting here at 36:35 (might autoplay, so turn down your speakers if you’re at work). They also make fun of the men’s right’s activists who didn’t like the new Mad Max movie quite splendidly. They both have Australian accents which makes everything 10% funnier, although they’re funny to begin with. It comes out once a week like the title implies and it’s usually an hour and a half long, so it’s nice to have on while I’m working. I should also mention that Nick Mason has an awesome Twitter handle I wish I had thought up, @WikipediaBrown. I was a huge Encyclopedia Brown fan in the 2nd grade. Bonus recommendation: The Encyclopedia Brown parodies from The Modern Humorist are hilarious and still available on archive.org. I LOVED Ready Player One. I listened to the audiobook. It’s great.